Quick, Draw! is a game where a player is challenged to draw a number of objects and see if a computer can recognize the drawing. The recognition in Quick, Draw! is performed by a classifier that takes the user input, given as a sequence of strokes of points in x and y, and recognizes the object category that the user tried to draw. The figure above shows the structure of the model that we will build in this tutorial. The input is a drawing that is encoded as a sequence of strokes of points in x, y, and n, where n indicates whether a the point is the first point in a new stroke. Then, a series of 1-dimensional convolutions is applied. 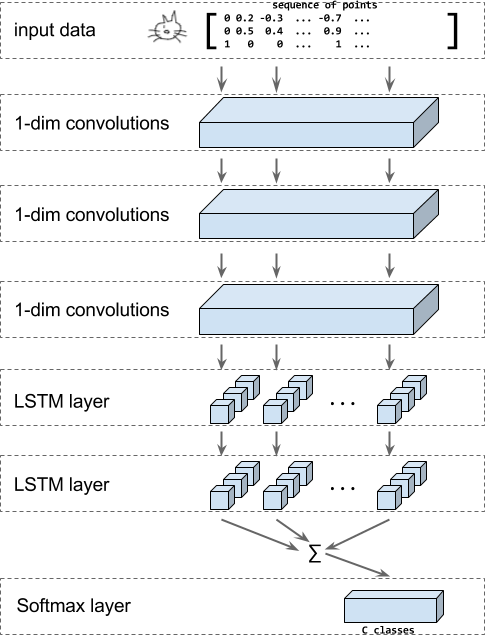 Then LSTM layers are applied and the sum of the outputs of all LSTM steps is fed into a softmax layer to make a classification decision among the classes of drawings that we know. This tutorial uses the data from actual Quick, Draw! games that is publicly available. This dataset contains of 50M drawings in 345 categories. Download the data in TFRecord format from here and unzip it. More details about how to obtain the original Quick, Draw! data and how to convert that to TFRecord files is available below. Execute the tutorial code with the following command to train the RNN-based model described in this tutorial. Make sure to adjust the paths to point to the unzipped data from the download in step 3. We make the data that we use in this tutorial available as TFRecord files containing TFExamples. You can download the data from here: http://download.tensorflow.org/data/quickdraw_tutorial_dataset_v1.tar.gz (~1GB). Alternatively you can download the original data in ndjson format from the Google cloud and convert it to the TFRecord files containing TFExamples yourself as described in the next section. The full Quick, Draw! dataset is available on Google Cloud Storage as ndjson files separated by category. You can browse the list of files in Cloud Console. To download the data we recommend using gsutil to download the entire dataset. Note that the original .ndjson files require downloading ~22GB. Then create a folder and download the dataset there. gsutil -m cp "gs://quickdraw_dataset/full/simplified/*" . This download will take a while and download a bit more than 23GB of data. To convert the ndjson files to TFRecord files containing tf.train.Example protos run the following command. This will store the data in 10 shards of TFRecord files with 10000 items per class for the training data and 1000 items per class as eval data. This conversion process is described in more detail in the following. For our purpose of building a classifier we only care about the fields "word" and "drawing". While parsing the ndjson files, we process them line by line using a function that converts the strokes from the drawing field into a tensor of size [number of points, 3] containing the differences of consecutive points. This function also returns the class name as a string. """Parse an ndjson line and return ink (as np array) and classname.""" Since we want the data to be shuffled for writing we read from each of the category files in random order and write to a random shard. For the training data we read the first 10000 items for each class and for the eval data we read the next 1000 items for each class. This data is then reformatted into a tensor of shape [num_training_samples, max_length, 3]. Then we determine the bounding box of the original drawing in screen coordinates and normalize the size such that the drawing has unit height. Finally, we compute the differences between consecutive points and store these as a VarLenFeature in a tensorflow.Example under the key ink. In addition we store the class_index as a single entry FixedLengthFeature and the shape of the ink as a FixedLengthFeature of length 2. To define the model we create a new Estimator. If you want to read more about estimators, we recommend this tutorial. reshape the input back into the original shape - where the mini batch is padded to the maximal length of its contents. In addition to the ink data we also have the lengths for each example and the target class. This happens in the function _get_input_tensors. pass the input through to a series of convolution layers in _add_conv_layers. pass the output of the convolutions into a series of bidirectional LSTM layers in _add_rnn_layers. At the end of that, the outputs for each time step are summed up to have a compact, fixed length embedding of the input. classify this embedding using a softmax layer in _add_fc_layers. The desired number of convolution layers and the lengths of the filters is configured through the parameters num_conv and conv_len in the params dict. The input is a sequence where each point has dimensionality 3. We are going to use 1D convolutions where we treat the 3 input features as channels. That means that the input is a [batch_size, length, 3] tensor and the output will be a [batch_size, length, number_of_filters] tensor. # Add dropout layer if enabled and not first convolution layer. We pass the output from the convolutions into bidirectional LSTM layers for which we use a helper function from contrib. see the code for more details and how to use CUDA accelerated implementations. To create a compact, fixed-length embedding, we sum up the output of the LSTMs. We first zero out the regions of the batch where the sequences have no data. The embedding of the input is passed into a fully connected layer which we then use as a softmax layer. # some gradient clipping stabilizes training in the beginning. Note that this tutorial is just a quick example on a relatively small dataset to get you familiar with the APIs of recurrent neural networks and estimators. Such models can be even more powerful if you try them on a large dataset. When training the model for 1M steps you can expect to get an accuracy of approximately of approximately 70% on the top-1 candidate. Note that this accuracy is sufficient to build the quickdraw game because of the game dynamics the user will be able to adjust their drawing until it is ready. Also, the game does not use the top-1 candidate only but accepts a drawing as correct if the target category shows up with a score better than a fixed threshold.